October, a golden month for watching and free downloading horror movies cuz Hollywood is putting its scariest titles into theaters as Halloween approaches. Similar to dress Jack-o-Ween, watching horror movies means people are fearless of the ghost. So the horror movies list is much sought after in October for a spooky night. Other than going to theater, to free download horror movies with the help of a strong movie downloader is more preferable, so that you can have a non-stop spooky entertainment without the interruption of constant buffering. To get top Halloween horror movies downloaded on PC or Mac, MacX Video Converter Pro (Mac version) is the one to the point. Unlike the movie torrent sites that put you in the risk of virus infection and even copyright infringement when you engage in free horror movie torrent download process, the horror movie download software is 100% safe and clean, freeing you from any uncertain virus and enables you to free download horror movies in HD 1080p, 4K or 3D from YouTube, Dailymotion, Vimeo, Pandora TV, Youku, Tudou, crunchyroll, and other 300+ movie download sites safely. With Intel QSV hardware accleration tech aid, it speeds up horror full movie download process up to 5X faster than any other movie downloaders. To download horror movie to Android, iPhone iPad is just a simple clicks as it offers you up to 350+ mobile profiles with best format and parameter settings ready for the latest iPhone XS/XR/X, iPhone 8 (Plus), Galaxy S8 edge+/Note 8, Apple TV, etc. Step 1: Free download the horror movies downloader and launch it on your computer. Click "YouTube" and "Add Link" button to get ready for horror movies free download. Step 2: Copy and paste the URL of the Halloween horror film in the box, or directly click the analyze button once you open the movie on YouTube as it will automatically analysis the URL itself. It's at your disposal to choose the horror movie output format, resolution, size and so on. Step 3: Specify the output folder by clicking "Browse" button to save the downloaded horror movie for this Halloween. Step 4: Press "Download Now" to start downloading the horror movie for enjoyment on home theater, Mac/PC, iPhone iPad and Android devices. Tip 1: The horror movies you download from YouTube or other movie streaming sites are saved in MKV, FLV, or other formats, which your mobile devices won't accept. 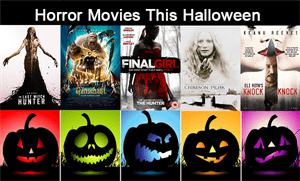 But this horror movie downloader is built in a vide converter with 370+ audio/video codecs, which converts Horror full movie video to MP4 or other formats that is playable on iPhone iPad or other devices. Tip 2: It is laden with a video editor that allows you to compress horror movies by 50% for easier storage, and cut and trim the scary recordings for further uploading on YouTube. You can be at your disposal to add subtitles to the movie. Optional: After downloading horror movies on your computer, you can consider to utilize the user-friendly MacX MediaTrans to transfer horror movies to iPhone iPad without worring about any data erasing. You are also priviledged to transfer the horror movie downloads in MKV or other files without any video audio incompatibility issue. As for the iOS and Android owners with enough free space for movie storage, you can consider to resort to free movie downloader apps such as Popcorn time, VidMate to get horror movies downloaded on your device. Without any third party help, it can individually help you download Halloween horror movie, classic horror movies, etc. thereon, be it from Hollywood or Bollywood. What's better, it even supports you to free download horror movies and other top-rated hollywood movies from numerous movie download sites including YouTube, Instagram, Vine, Tumblr, Soundcloud, Metacafe. . Currently, the horror movie is avialable for download on some torrent sites like The Pirate Bay. But be careful of some virus during the horror movie download. If you cannot wait watching the movie plot, don't forget to free download horror movie trailer from YouTube to get some clue. It receives much acclaims among customers and is worthy adding to the best horror movies list 2017. If you are fond of Saw series, Jigsaw, the eighth installation of Saw, defnitely deserves your extra watching. If you love horror movies revolving around dolls, Annabelle is your first choice. You can free download horror movies from YouTube red or other services. This is a story of sexual awakening and coming-of-age drama, exploring the character in themes of religion, fundamentalism and patriarchal rule. Split looks much like the horror movie classic Pyscho, telling about a person with 23 personalities. There aren't any horror movies at the end of the year. But you can take a try and enjoy the title synposis by downloading horror movie trailer from YouTube. Feel free to stream the movie over netflix or download horror movie to see how the crew of the colony ship Covenant attempts a harrowing escape. Adam Robitel steps in for the 4th installment of Insidious. We are looking forward seeing it. Movie goers can sneak peak it via downloading its movie trailer. Do not miss this classic mix of comedy and terror for a family-friendly film with a bit of bite. Knock Knock is tailor-made for fans of the horror-thriller genre. Jack Skellington, king of Halloween Town, discovers Christmas Town, but doesn't quite understand the concept. This animated movie is a family favorite for all ages. The PG-rated movie should be the rare horror film enjoyed as a family, plus it's bound to trigger your millenial nostalgia! This movie is about three students who attempt to make a documentary and get too close for comfort to their subject: the Blair Witch. "Beware of Crimson Peak." Such is the motto for this Gothic thriller. Fans of the Gothic aesthetic (see: Tim Burton) will greatly enjoy this film. The disturbing thriller about a monster will leave you at the edge of your seat with chills. The Last Witch Hunter should be the most action-packed horror film this month. This is a free Halloween theme song download solution for you to freely download 2016 Halloween soundtrack in MP3 and make Halloween theme song ringtone for your iPhone iPad and Android with the best free YouTube downloader. MacX Video Converter Pro is a smashing horror movies downloader with high quality and incredibly fast speed. It also provides superfast solution to download MP3 music, videos and movies from 300+ online sites.